diabetes, heart disease, stroke, and cancers have been well documented; so we switched to baking our own 100% whole wheat bread. We found that dense, unappealing whole wheat breads are not the norm – light, nutritious, nutty tasting bread are entirely possible using 100% whole wheat; it just takes the right ingredients and equipment (the secrets). The most important ingredient is, of course, the wheat. 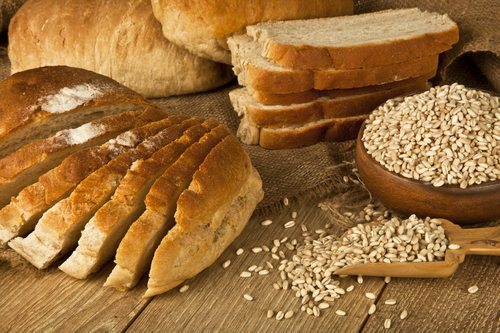 For making whole wheat bread, wheat with high gluten and protein content is necessary – hard red or white (spring or winter) wheats have sufficient gluten and protein content. Soft wheats have less gluten and protein and are good only for pastry flour. Most of the good wheat produced in the US is from Montana, and for whole wheat bread, it should have a protein content of at least 14% (all-purpose whole wheat flour has about 12% and pastry flour about 7%). Once you’ve got the right kind of wheat, it’s important to make sure that it’s fresh. Whole grain wheat kernels will store almost indefinitely at room temperature; however, as soon as they’re ground, they go rancid very quickly. At room temperature, whole wheat flour will keep for a month – after that, unless preservatives are added, it will start going bad. So, it’s sometimes difficult to get 100% wheat flour from a store that still tastes good. If it’s fresh, it should taste sweet, not bitter. Obviously, if it’s older than a month and has started to go rancid and turn bitter, it’s not going to make great bread. If you can find a convenient source of fresh whole wheat flour, then you don’t need to invest in a mill to grind it yourself. 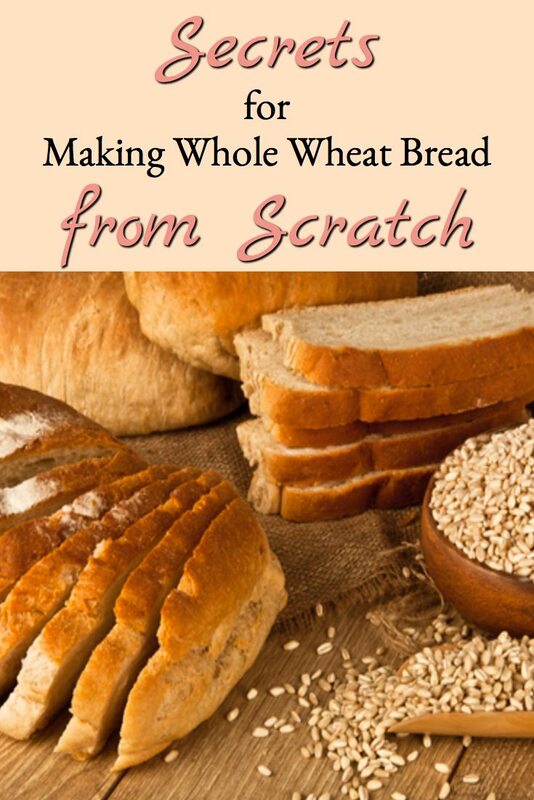 However, if you’re committed to making your own whole wheat products, then it’s a consideration – buying whole wheat kernels is a lot cheaper than buying whole wheat flour, and freshly milled wheat is much sweeter, tastes better, and is better for you. 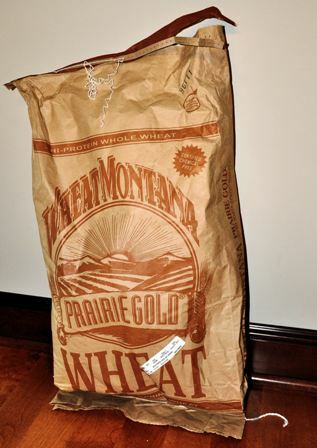 We like the hard white spring wheat “Prairie Gold” – we buy it in 50 lb. bags, and are able to find it at several Amish-run establishments near us. There are a variety of bread mills for grinding flour – from hand cranked to electric. 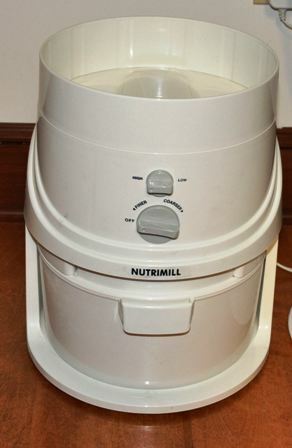 Evaluating all the pros and cons of the various mills is beyond my expertise – I’ll just say we bought an electric “Nutrimill” and have been very happy with it. It wasn’t inexpensive at the time (and I don’t know what they cost today), but it’s convenient, easy to clean, and has been running well for years. If getting a mill, in addition to considering the cost, convenience, ease of cleaning, and versatility; the one thing to avoid is getting one that will overheat the flour while grinding – that will negatively impact bread quality. Generally, it’s best to grind only as much flour as you plan to use – since the freshly ground whole-grains go rancid very quickly. 1 cup of wheat berries will produce 1 ¾ cups flour and one pound of wheat berries will produce approximately 4 ½ cups flour. 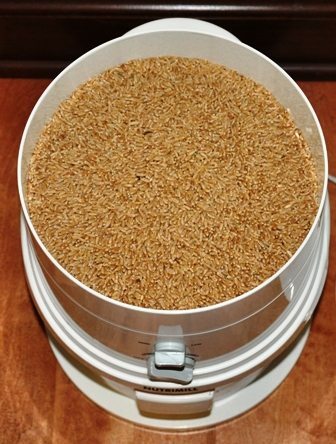 In our set-up, after adding the wheat berries and setting the Nutrimill (it’s set for speed and coarseness of grind), a very finely ground, light brown flour is the result (the berries go in the top and the flour comes out of the bottom in the Nutrimill grinder). The recipe we use for everyday 100% whole wheat bread is pretty basic; and comes from The Laurel’s Kitchen Bread Book, by Laurel Robertson. 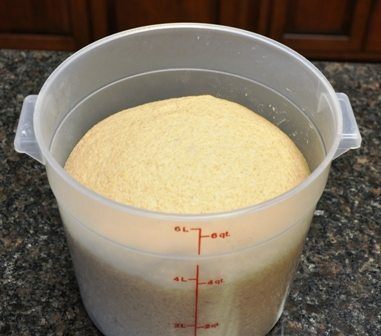 2 teaspoons dry active yeast 1/4 oz. Yeast has three major functions in bread baking; it makes the dough rise, gain strength, and develop flavor. When flour, water, and yeast are mixed; yeast consumes the sugar in the flour and gives off a liquid that releases carbon dioxide and alcohol into the air bubbles in the dough. If the dough has a strong and elastic gluten structure, it will contain the released carbon dioxide bubbles, and the dough will rise. 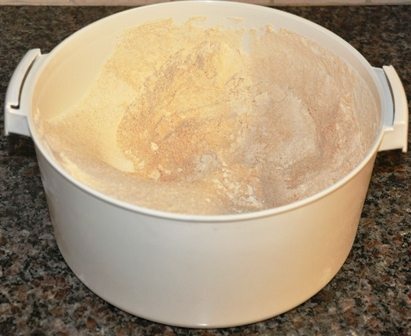 When flour and water are mixed, any further working of the dough causes more gluten to form. So, each time carbon dioxide is released by the yeast, it causes more flour and water to connect, and form yet more strengthening gluten. In addition, the by-products of the carbon dioxide and alcohol reaction produce flavor in the bread. Obviously, it’s very important that the yeast is fresh so that it can drive the reactions described above. The most common form of yeast for home bread baking is active dry yeast, and that’s what we use. Refrigerated active dry yeast kept in an airtight container will maintain its potency for several months, so be sure to buy it from a refrigerated case. Once we get it home, we store it in the freezer and have used it up to a year later (the manufacturers probably don’t recommend this – but it works for us). Water for bread baking should be neither very hard nor soft, and good drinking water generally works well. Very hard water inhibits the yeast reaction, but adding a tablespoon of cider vinegar or lemon juice may help. Very soft or distilled water makes a dough that doesn’t rise well, and it isn’t recommended for baking bread. Chlorinated water is generally ok for making breads that are leavened with dry active yeast. Like yeast, salt has three functions in making bread; adding flavor, strengthening the gluten, and regulating yeast growth. Bread without salt generally seems flavorless, rises too quickly, and has a crumbly texture (it is possible to make good tasting salt-free bread – it just takes a bit more work); but, the type of salt used doesn’t seem to affect the quality of the bread much. 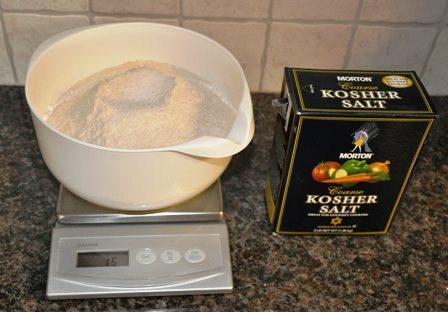 We’ve used iodized table salt, kosher salt, and sea salt; and not been able to tell a difference – so we’ve settled on using kosher salt because it’s additive free and less expensive than sea salt. Sweeteners are not necessary for good bread, there are enough sugars in whole wheat flour for the yeast; however, sweetener can improve the breads texture (making it tender) and flavor. 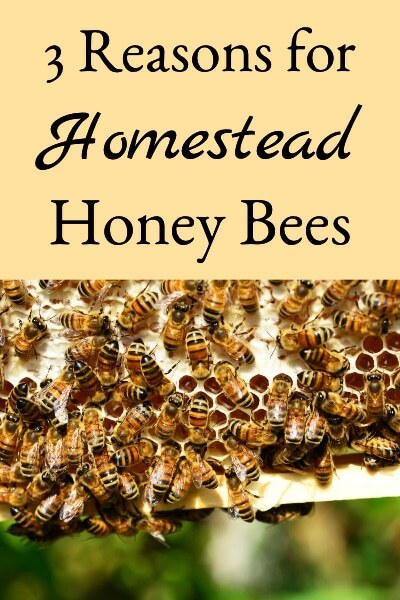 Honey, molasses, granulated sugar, or brown sugar can all be used, but we like honey. We’ve got honeybees, so we’re likely biased. Honey can vary tremendously from jar to jar though; so commercial bakers generally use light, pasteurized honey to minimize any negative impact those variations might cause. 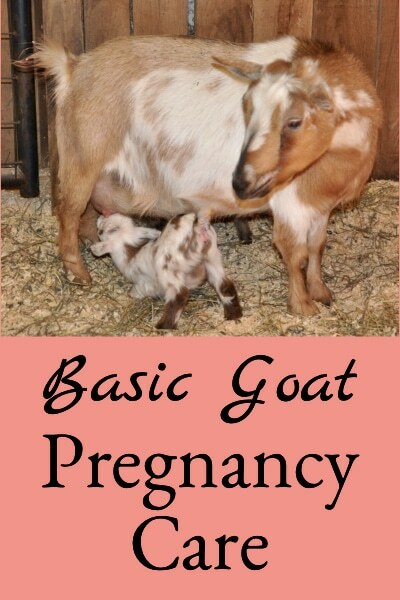 We use raw honey and haven’t had any issues – but most books recommend pasteurized honey instead. Fat, like sweeteners, isn’t necessary for good bread, but a little bit of oil or butter improves the bread texture (again makes it tender), flavor, and shelf life. We use either real butter or good olive oil, and make sure that it’s fresh too. 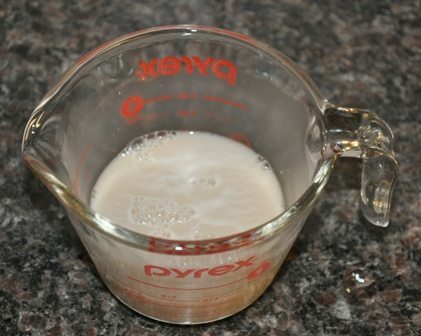 Once all the ingredients for the recipe are gathered, dissolve the yeast in the 1/2 cup warm water – the water should be between 105°F and 115°F, and make sure the yeast has completely dissolved. Place the flour in a large bowl, mix in the salt, and make a well in the middle of the mixture. Dissolve the honey in the 2 1/4 cups water and add the oil (if using). Pour the liquids and the yeast mixture into the well in the flour. Stir from the center and combine the ingredients to make a smooth batter. Coarser flours take longer to absorb water, so allow a few minutes for complete absorption of the water (depending on the coarseness of the flour grind) before evaluating the dough. At this point, the dough should be evaluated to determine whether it’s too stiff or too watery – this is something that you get better at over time. With clean hands, feel into the dough and decide whether it needs more water or flour. It should be sticky and wet, but it shouldn’t be waterlogged. It also shouldn’t be too stiff, or it’ll turn into a bread brick. 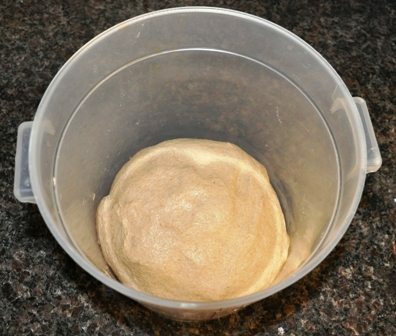 If more flour or water are needed, return the dough to the bowl, add 3 or so tablespoons of flour or water (depending on whether it’s too stiff or watery), mix well, and reevaluate. Proceed with kneading when the dough consistency seems perfect to you. For really great whole wheat bread, it’s necessary to knead. We accomplish this using an automatic Bosch mixer and generally knead the dough for 15 to 20 minutes (or about 600 strokes if done manually). 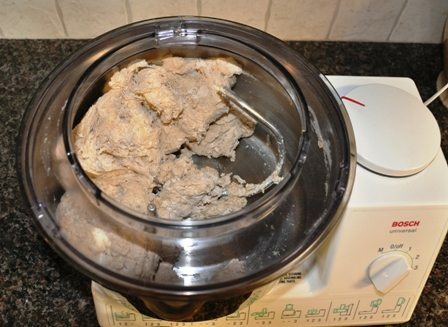 Like the Nutrimill, I don’t think the Bosch mixer was inexpensive when we bought it; however, it’s made so many loaves of bread now that it’s turned into an excellent value (and we’d never have stuck with making our own bread if we’d had to knead it ourselves). After adequate kneading, the bread should be very smooth; and when gently pulled, it should stretch without tearing. 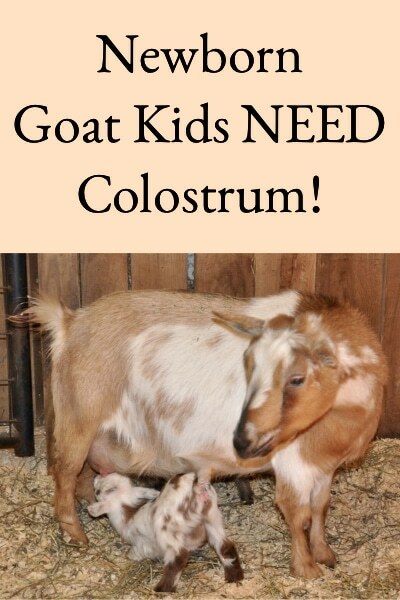 It should lose much of its wetness and become a more uniform beige color. The pictures above and below illustrate what the dough should look like at the beginning and end of kneading. 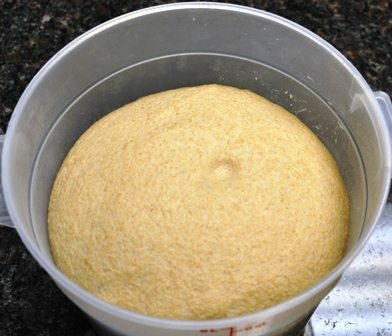 Many bread recipes tell you to “let the dough rise until it doubles in volume”; but, that’s not a very accurate way of determining whether the dough has risen as much as it should. 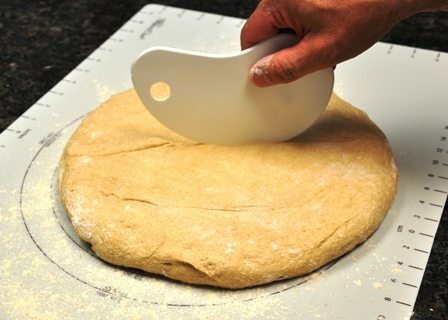 Instead, determine whether the dough has risen sufficiently by doing the “finger poke test”. When you poke the dough with your moistened finger, the hole should not fill in at all (see photo below) – then it’s ready to move to the next step. If the hole fills in some when you take your finger out, the dough needs to rise a little longer. 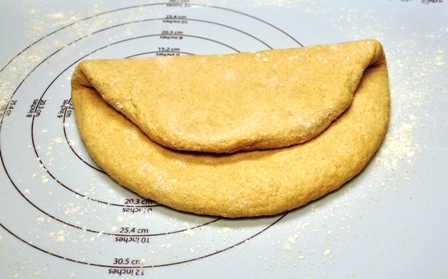 Once the dough has completed the first rise, with a moist hand gently flatten the center of the risen dough, then flatten the dough around the edges. Then, using a rubber spatula, gently remove the bread from the container and fold the dough down around itself at the edges to form a small, firm ball again. Place it back into the bowl and put the cover back on for the second rising. 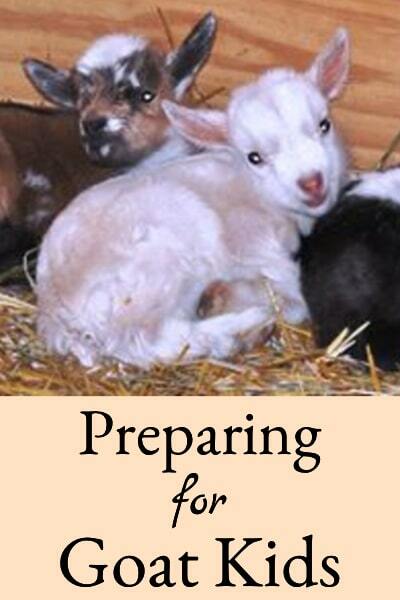 The second rising should take about half as long as the first, and testing for completion is the same. 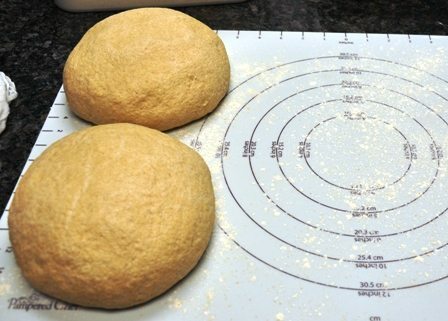 Once the dough has finished the second rise, it’s time for rounding. To do this, dust your working surface lightly with flour, and using the rubber spatula, gently remove the dough from the container onto the dusted surface – top side down. 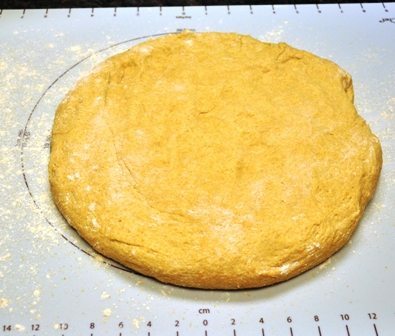 Then, with moist hands, gently flatten the dough into a circle about an inch thick. Fold the edges of the dough inward as you go around, and then invert the dough ball folding the edges of the dough beneath to form a ball. Repeat with the second half. After rounding, the dough balls should look like those shown in the picture below. 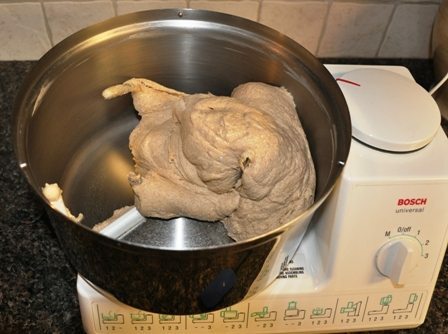 The dough needs to rest after rounding and before being shaped into loaves. 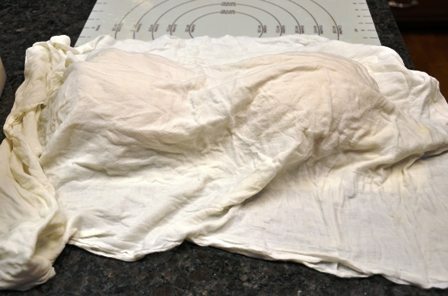 Cover the dough with a damp cloth and allow to rest for approximately 10 minutes. 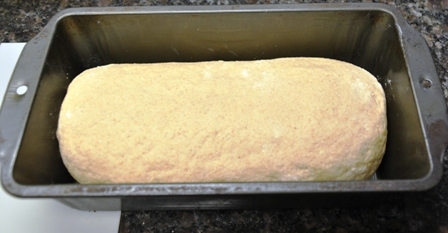 While the dough is resting, it’s a good time to grease two 8″ x 4″ loaf pans in preparation for baking. The rounded dough should be shaped after it has softened or relaxed. It should be shaped gently to avoid tearing any of the gluten that you’ve been working so hard to develop. Dust your working surface lightly with flour. 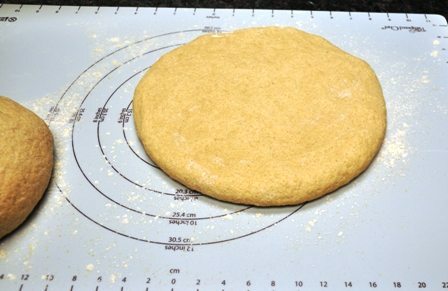 Then put the relaxed dough on the working surface, upside down and press into a one-inch thick circle. 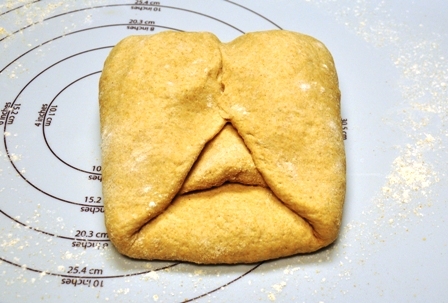 After that, fold the dough over, but not quite in half as shown below. 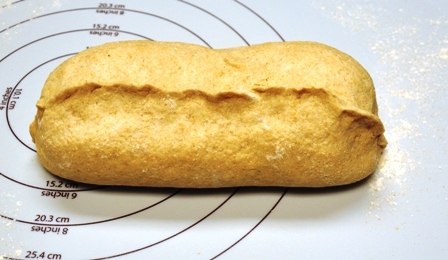 Make sure gas doesn’t remain trapped in the loaves when shaping in the following steps. Next fold the pieces in from the sides, and here you’re trying to make the length of the dough about two-thirds of the length of your loaf pan. Then fold the two halves together………………. And press the two halves together. 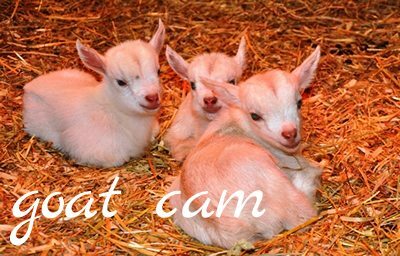 Press the seams together to seal them…………. 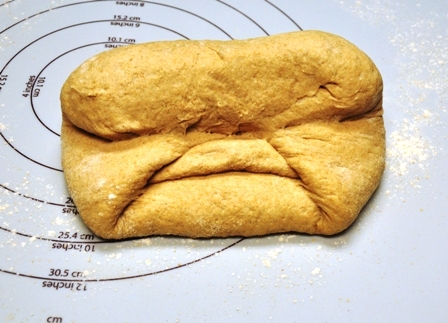 And place the loaf seam side down in the greased loaf pan. The final rising in the pan should take 30 to 45 minutes, and it’s important to prevent the surfaces of the loaves from drying out – so it’s a good idea to cover with a damp cloth again during the final rising. While the dough is rising, preheat the oven to 425°F. The dough is ready when the indentation from your finger fills in slowly – at this point you don’t want it to remain unfilled as in the previous risings because the dough should continue rising slightly in the heat of the oven. 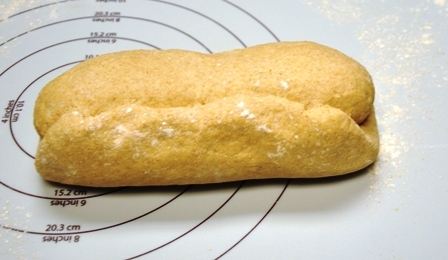 If all the kneading, rising, and shaping works properly, the loaves should arch over the tops of the pan with the sides touching all the way, as shown below. Once the dough is ready for the oven, gently place the loaves on the racks as near to the center of the oven as possible. After 10 minutes, turn the temperature down to 325°F. Bake for 45 to 60 minutes, or until the bread tests done. All the kneading, multiple risings, and careful shapings seem like a bit of work – but the results are glorious, nutty-tasting, light 100% whole wheat loaves like those below. 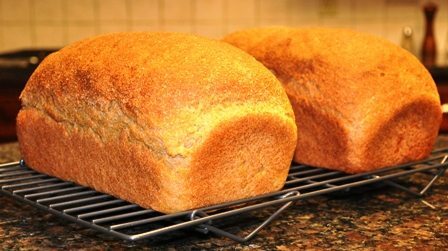 There really isn’t anything much better than fresh, homemade whole wheat bread! 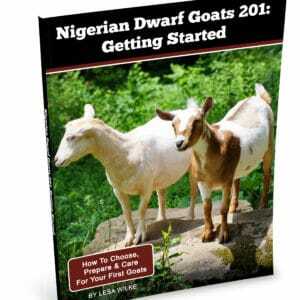 « Keeping Roosters – Should You? We grow our own wheat so we always have our own wheat berries to grind. Wheat bread is the best. 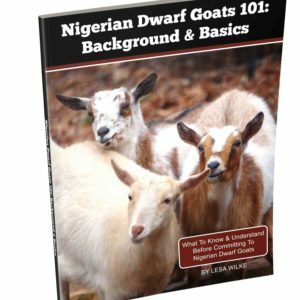 Found you on Homestead Blog Hop. Hi Candy, Having your own wheat would be awesome. And we love our wheat bread too! My bread doesn’t seem to be building gluten like it should. I kept kneading and kneading and it was still breaking instead of stretching. If you’re hand kneading, it takes a LOT of kneading (as the recipe says at least 600 strokes) – that’s why we use the machine. Baked this bread recipe for ten minutes at 425 degrees, then 30 minutes at 325 degrees, as recommended in this recipe. Top of crust is dark brown. Perhaps my oven is too hot at 425 for bread? 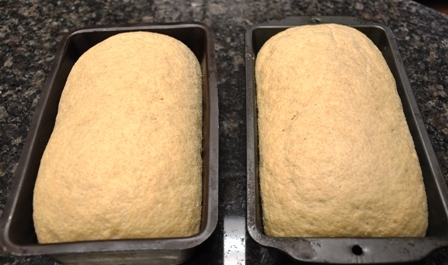 Perhaps it is, this turns out 2 perfect loaves (as shown) every time for us! 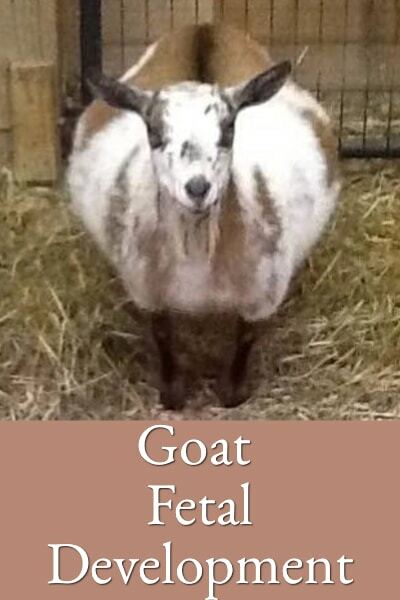 Tastes delicious and the texture is perfect. I will turn down my oven to 400 next time around. Thanks. 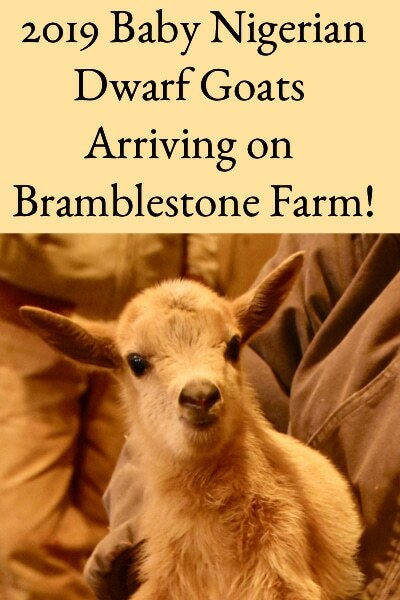 I’m glad the taste and texture are good – soon you’ll have it perfected!